Now I’ll be the first to tell you that I’m a huge sports fan. The sound of cheering and applause after the singing of the national anthem gives me goosebumps every time. And I’m open-minded too. Cheerleading? Sure, it’s a sport, as long as flips and jumps are involved; I’m not talking about the peppy yelling that goes on on the sidelines of football games; I mean the cheerleading competitions. Golf? Definitely it’s a sport. You hit a ball one inch in diameter 400 yards in four shots and land it a hole merely 4.25 inches wide and then get back to me on whether its a sport or not. Poker? Sorry Phil Ivey, I’m not that open-minded. But the other night, as I was watching the Olympics, I found myself following the men’s figure skating event (don’t judge me) and was surprised to find that I could not decide whether or not I considered it a real sport. My first instinct was to say yes. I know that I could never get out there and pull off a triple axle (I was the kid holding on to the boards during peewee hockey); but I also know I could never carve a statue out of marble or bake a wedding cake, but neither of those are sports. Thus, an activity that simply sits off my radar cannot be considered a sport. And the costumes. Don’t even get me started on the costumes. In a period of one hour, I witnessed men wearing Shakespearean robes, plaid button-downs with overalls, mesh shirts (wait, can they be considered shirts if they’re missing sleeves and buttons) and about ten million sparkles. Apparently pink was going out of style. Ladies and gentlemen, the man representing the United States men’s figure skating competition, Johnny Weir. I think it’s safe to say he definitely has more talent than fashion sense, but talent does not directly translate into sport. People with precise aim have an extraordinary talent, yet not all of them are athletes. Pitchers are, whereas dart players are not. One competes in our national pastime, the other, in bars. Sorry Johnny Weir, but for me, figure skating is like darts. Hockey is the sport. There’s a reason the kid in the Mighty Ducks decided to play hockey instead of figure skating–he wanted to be considered an athlete (and I hear he was allergic to nylon). But overall, the real reason I came to the conclusion that figure skating is a faux-sport is simple–it has reached a plateau of skill; everyone who is out there skating is capable of doing the exact same jumps, spins and tricks. No one is coming up with new stuff. So as every skater finished his routine, I became less and less impressed. He would start in a femininely provocative pose, waiting for the music to start. The music and routine would begin slowly. A few spinning jumps would be attempted. The music’s tempo would then increase, allowing the skater to dance (unfortunately for those watching). Then, the music would slow down again; the skater would do some spins, usually grabbing his foot in a position that makes me question his manhood. Finally, the skater (or should I say dancer) would come to a sudden stop, look to the crowd, and either metaphorically or literally blow a kiss to the audience. And whoever followed these steps the best, stumbled the least, smiled the most and glowed-in-the-dark the brightest would win. Maybe. Because, after all, the winners are subjectively decided by judges, and don’t even get me started on that. This entry was posted on Thursday, February 18th, 2010 at 6:48 am and is filed under Olympics. You can follow any responses to this entry through the RSS 2.0 feed. You can leave a response, or trackback from your own site. Why is there no article about Crew? Is my sport completely neglected by the World! 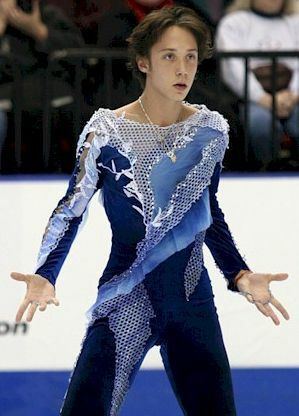 Oh god… Johnny Weir. He’s quite a character, but man, he is strange. I had seen the Poker Face video before, but each time I watch it, I tend to laugh harder. As much as I hate and do not want to admit it, I may say figure skating is a sport. Only because I know how difficult it is for people to skate, let alone do the flips, spins, and tosses that these competitors (notice I did not call them athletes) do. Ice skating is a sport. To me its basically like gymnastics on ice and no one questions gymnastics. Don’t get me wrong they have made a spectacle out of it but it is still a sport. I have much respect for the skaters and the gymnast because they train for these events almost all year round, and that has got to be hell on their bodies. They’re athletic, without a doubt…but to me, it is an event. No sport has costumes. And costumes add to their performance? Whatever happened to talent being the only determinant in winning and losing? Ice skating takes athletic skill. It just doesn’t mean it’s a sport. Think of it like horseback riding; you have to have the proper attire. I had a friend who used to ride competitively and she would tell me how ridiculous the politics of the sport were: if you did not have on the in style hat, jodhpurs or boots, you would be score poorly. Back in 1998, I was a fan of Tara Lipinksi and read her autobiography. She wrote that you had to have the right outfit or else you would be judged with a low score. In the summer Olympics, all of the gymnasts have on sparkly, fun leotards as well. I see what you’re saying but I just can’t fathom the idea that what you wear will determine how you’re scored. And horseback riding isn’t a sport either. That’s like NASCAR. And all the gymnasts also have their country’s flag and a competition number on their leotards. Not the case with ice skating. Without a doubt, Poker is not a sport. But I think ice skating is. It involves a lot of physical activity and skill. It is also competitive. You made a convincing argument though. You made a good argument, but I think ice skating is a sport. Even though there are costumes, music and sparkles, their movements still take a lot of skill and are judged more than the other elements. First of all, golf is not a sport, its a hobby. Yes, it takes talent, like carving a statue out of marble but it’s like saying that fishing is a sport. There is no true endurance necessary, it just takes skill, and there are a lot of activities in life that take skill but they are not sports. So no, as much as you like golf, it’s not a sport. However, golf is closer to being a sport than figure skating. Personally, I decide sports based on how the winner is determined. A win by judgment is a win for a competition, not a sport. A win for a sport is based on actual points, like baskets, runs, touchdowns etc. And yes I know that certain jumps in figure skating are worth more “points” but points are also obtained by choreography and interpretation. If the same were for other sports… then LeBron James would get 3 points instead of 2 for every slam dunk. Or a slide into home would be worth more then just running through. Or a scissor kick into goal would be worth more then a simply boring tap. Think of the endless possibilities! I see a lot of what you’re saying. My only problem is that boxing requires judges scoring in order to determine the winner, and I would be interested to see how you go about proving boxing is not a sport.